The report that measures the health of the Prince Edward County community using data gathered from multiple sources over great expanses of time was released on Wednesday and, if a diagnosis was to be determined, it would be a complex condition with symptoms of disassociation, disparity and disdain. 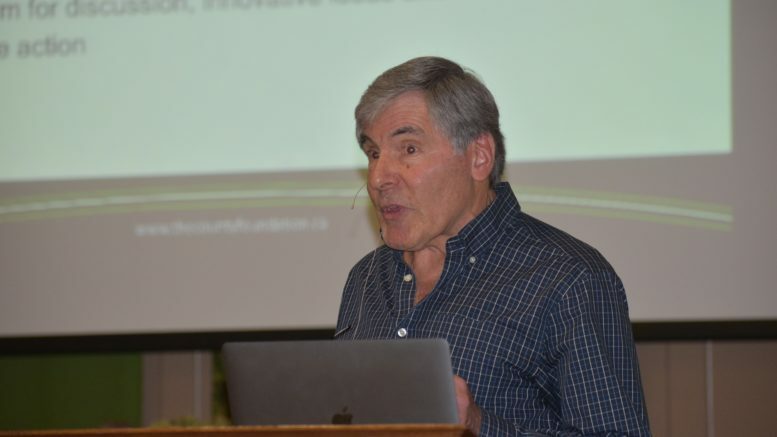 In front of a near-capacity audience at St. Andrew’s Presbyterian Church, The County Foundation president Brian Beiles offered an overview of what was entailed in the 18-page glossy magazine-style 2018 Vital Signs which inspired readers to work together to build a community where everyone belongs. The urging title on the front of the report is quite appropriate because the data within indicates the feeling of belonging amongst some in this proud Loyalist community that was forged in early 1800’s in the days following the American insurrection and has seemingly been a beacon of rural Ontario living with a deep sense of pride ingrained into the day-to-day activities has decreased. This fact was an important finding of the 2018 Vital Signs report according to Beiles who spoke to the Gazette following Wednesday’s presentation. “The theme of the report is belonging and what seems to have occurred over the last five years is that Prince Edward County has grown tremendously in terms of popularity,” Beiles said. In other communities, that popularity might be highly desired and never realized but locally, it’s created an influx of money and tourism that certain segments have benefitted from. Even though Prince Edward County has seen 104 per cent growth (1,096 new businesses) in self-employed businesses in just four years and 60 per cent growth in registered business during the same time period, employers still face a number of issues those in neighbouring communities do not struggle with. Included in the employment section is data on income that shows the median household income after tax in Prince Edward County was $59,259 which trailed the provincial average by about $6,000 and that the prevalence of low-income seniors in the municipality still trails the provincial average of 14.4 per cent, the rate has almost doubled from 5.3 per cent in 2010 to 10 .4 per cent in 2018. Housing seems to be the fall back position of any issue in Prince Edward County and the data certainly indicates that attainable shelter is becoming increasingly rare here. House prices locally have almost doubled in the last decade with the median house costing $395,000 in 2018, up from $208,000 in 2018. Housing costs in Belleville and Quinte West have increased but not by nearly the same rate. The implications of this housing boom is young families, lower income earners and many seniors are now excluded from buying and owning homes in Prince Edward County. Precipitously, prospective employees have nowhere to live. The study also indicates that 17 per cent of homes in Prince Edward County are not occupied by usual residents which is more than double (8 per cent) the provincial average. On the long term rental side, a 2018 municipal survey indicated there is a 0.8 per cent vacancy rate for registered rental units and almost half of Prince Edward County’s renters are paying over 30 per cent of their household income on housing. Beiles said the tourism boom and the marketing Prince Edward County as a summer time retreat has been good for visitors, some businesses and individuals but it hasn’t been good for the community overall and there’s a need to find a balance between what’s seemingly good for business in the short term and what is sustainable in terms of infrastructure and things that need to be in place to support that. Attainable housing is being addressed through a number of measures including the formation of a municipally crafted not-for-profit PEC Housing Corporation, initiatives to turn the former Wellington Arena and Pinecrest Memorial School into housing units and the addition of a half dozen new Prince Edward-Lennox and Addington Social Services housing unites by the end of 2019 but it’s clear from the data that housing is a concern that The County Foundation will continue to monitor. Education is another item that’s been identified as an area of concern in the 2018 Vital Signs report. Secondary school graduation rates have improved in recent years but their increases mirror those of provincial average gains and the Hastings and Prince Edward District School Board still lags behind the Ontario averages. Perhaps more worrisome is the local lacking in the Early Development Index which assess children in a handful of domains prior to entering Grade One. Locally, 37.3 per cent of Prince Edward County Children are vulnerable in one or more of these domains and studies show the highest rate of vulnerability was in the physical health and well being domain. According to the statistics, if housing, employment, food security and transportation are compromised, children will suffer. “We had to put a stake in the ground somewhere and improving and supporting better rates of Ontario secondary school graduation is a broader focus is that will increase better outcomes for youth in this community,” Beiles said. It’s hopeful that an intiative taken on by the Greater Than County Youth Collective will help parrot local secondary school graduation rates by 2026 but the Foundation is also eyeing the troubling EDI numbers as well. But there is still a long way to go if the divide that’s been created by the instant prosperity of the Prince Edward County is to be bridged and a re-crafting of a community that seemed so magical not long ago. “The lack of shared prosperity is creating a social impact and we would like to close the gap and make this place have a sense of belonging and feel this is a community that people feel like this is a community live in, reside in work in and participate in,” Belies added. The County Foundation will host an advisory committee meeting later this month with it’s 13 partner agencies to determine a course forward that will create broader engagement and understanding of the issues found in the 2018 Vital Signs report and how to collaboratively address them through action. Hard copies of the report are available at the County Foundation office at the Edward Building on Main Street in Picton.